I am a resident of California, and I’m writing to protest your pledged support for the PROTECT IP Act, a law that will threaten the very open and innovative nature of the internet. It is appalling to me that a longtime U.S. Senator such as yourself does not avail herself of the numerous technology experts that almost unanimously say that this legislation is incredibly harmful to the internet. It is appalling to me that the hearings on this legislation were packed with media conglomerates who have a vested interest in protecting an outdated business model, and only one technology company was invited to participate. It is appalling to me that my representative — you — is actively ignoring the possibility of educating herself about technology, and is willfully remaining ignorant because of the money that media companies have contributed to her campaign: [$571,600 or $54,750]. Piracy is not a problem. 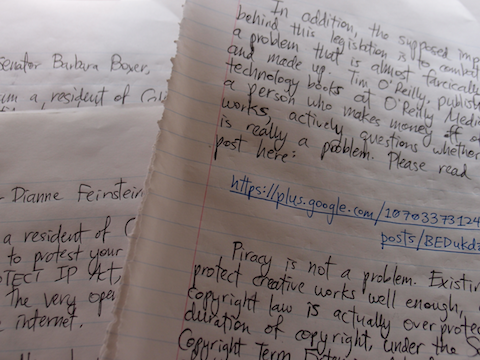 Existing laws protect creative works well enough, and copyright law is actually overprotective. The duration of copyright, under the Sonny Bono Copyright Term Extension Act of 1998, is lifetime of the author plus 70 years. This is ludicrously long, and prevents even works from the mid-1800s from being released into the public domain, where everyone would ultimately benefit from the wide availability of content. And current law imposes penalties of up to $150,000 per work, which is absurdly out of touch with the actual amount of monetary damage caused. I am a software engineer, and while I don’t enjoy it when people don’t pay for my work, I am not concerned about the problem. I still get paid without threatening anybody for “stealing” the apps that I write. Have you actually talked to anyone about this issue? My representative, Rep. Anna Eshoo (and, soon, Rep. Nancy Pelosi) is opposed to the PROTECT IP Act’s counterpart in the House, the Stop Online Piracy Act. Talk to her about this issue, and find out why she opposes it. Know that if you vote for the PROTECT IP Act, I will not vote for you in the next election. ProPublica publishes total campaign contributions related to SOPA and PROTECT IP.